It's a strange land that leaves me with different feelings whenever I come to rediscover it. Sa Pa is an incredibly picturesque town in the Hoang Lien Son Mountain Range near the Chinese border in northwestern Viet Nam, 350km from Ha Noi. It can be explored almost year-round from March to early December. Vietnamese most like to visit during June and July to escape the summer heat in other parts of the country. Sa Pa is 1,500m above sea level so the weather is quite mild, and cold at night. The best time to go to Sa Pa is on a weekday, as weekenders tend to flock here. However, the famed "love market" only takes place on Saturday nights, so visitors often extend their tour to Saturday to experience it. 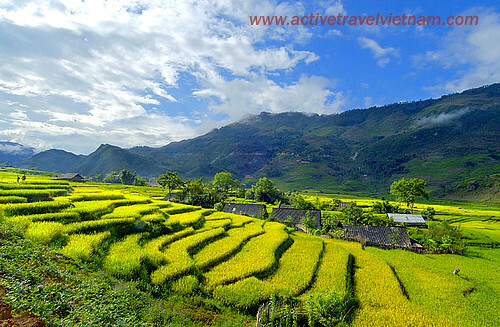 Tourists can see many hill tribe people, their villages and rice terraces. The ethnic minority groups generally retain their lifestyles and traditional costumes. The area's high mountains, deep ravines and lush vegetation rise to the peak of Mt Fansipan – the highest point in Indochina. The combination of fresh mountain air, relaxed ambience, sweeping panoramas and fascinating hill tribes make Sa Pa a must-see destination. A trek took us deep into a hill tribe region where tourists are still something of a novelty. Staying in village homes allowed us to experience firsthand a lifestyle that has been little touched by the modern world and a curiosity from our hosts just as great as our own. 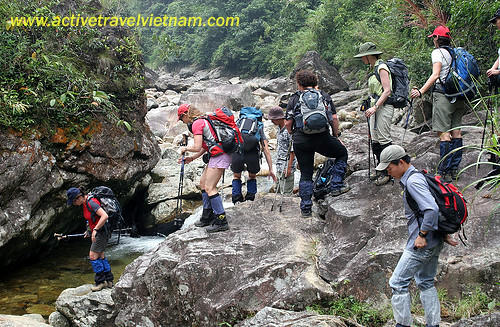 The trekking is fairly strenuous at times but the spectacular scenery and sense of adventure make it worth the effort. Ta Phin Cave, at the far end of Ta Phin village, is an attractive destination which tourists often bypass without a local guide's suggestion. The cave requires a guide with a flashlight, and the guide will shine the torch on a variety of stalactites. Some of the locals invite visitors to go to their homes to show how they live and what they have, and tell them about their families. On following them to their houses, tourists find out how simply they live. The tour guides suggest you to buy the merchandise you like from them as repayment for what they have shown for you. Local tour guides also lead the trips to the forests and mountains because they know thoroughly the terrain. City lovers may find Sa Pa is not the place for them as its rich ethnic lifestyle is far removed from modern life. If you expect to go shopping in malls, Sa Pa has nothing to offer. The only way to go shopping is to go to the local market where you can find unique handicrafts, jewelry and fabrics with colourful embroidery. While tourists don't know how to bargain or choose the best items, the local guides are ready to help. Sa Pa is famous for its "love market" where local young people go to show off and find partners. It is held every Saturday night and provides a unique and unforgettable experience. The love market is a tradition in the culture of the Mong, Tay and Dao. All the people around Sa Pa live in isolated villages and can only get together once a week during the Sunday morning market. The night before, young men and women from all around come to the love market to meet and express their emotions through playing the khen (pan pipe) and singing according to traditional customs of their people. The experience of Sa Pa trip is not something that everyone can buy, but adventurous people and those who seek to know the hidden charm of Vietnamese hill tribes living in their old traditional mountain villages cannot miss this place.